In news that is sure to make NewsComa a very happy blogger, zombies are getting more and more popular every day. I don’t mean actual zombies, since the smell and the flesh-eating is still enough to keep them far down on the list of invited guests to your average party; I’m talking about movie zombies. They’re everywhere these days; it’s like the 1970’s all over again! I could not be happier! Case in point, this awesome motorcycle combining zombies and custom choppers! Combining the 60’s-70’s love of zombies with the 60’s-70’s love of sleazy biker movies is the graphic novel Chopper Zombie. The bike, inspired by the graphic novel, is the work of Russell Mitchell and Exile Choppers, and it is a thing of gory beauty. 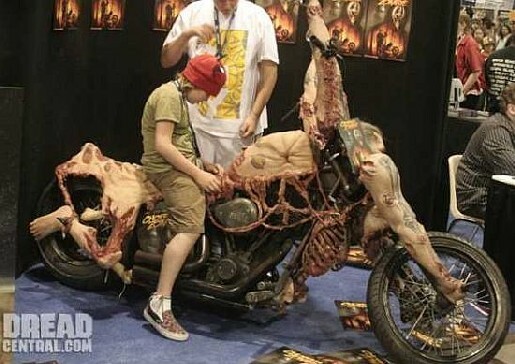 Who couldn’t love hopping on a bike decorated with decaying human parts? There’s one thing you can say about PopFi: We’re your source for the best in zombie artwork!